Do you have those go to recipes that you know will ALWAYS please everyone? I have quite a few up my sleeve, but I love these little cookies for their toffee crunch and chocolaty goodness. Plus you literally toss all the ingredients together and portion them out. How simple is that? 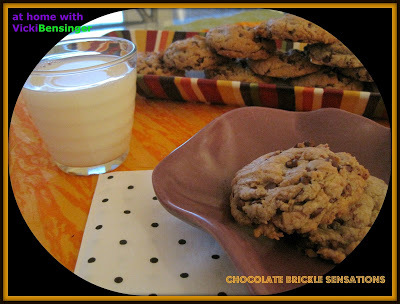 When company is coming unexpectedly, or I’m looking for just one more sweet treat that I know will be a hit, I pull out my recipe for Chocolate Brickle Sensations. I’d love to claim this recipe as mine, but some 20 years ago I saw it in our local paper – a recipe sent in by a Pat Bollwerk. I tore it out of the paper and have had it filed ever since, creating this recipe over and over again. Preheat oven to 350F degrees. Line cookie sheets with parchment paper. In a large bowl, combine all ingredients together. Stir by hand until well mixed. Using a small cookie scoop or teaspoon, drop cookie dough onto parchment lined cookie sheets. Bake 8 to 10 minutes, or until browned. If you make these, I’d be curious to know how long they lasted. GUARANTEED A WINNER! They’re perfect with an iced cold glass of milk. Yup , the name itself sounds scrumptious 😀 I’ll drop by later , so save a dozen or 2 for me ! Oh they’re all gone already. They don’t last long. So yummy sounding Vick, these have my name written all over them. You probably didn’t know that my middle name is Brickle 🙂 not really but as much as I love those delicious toffee bits, it might as well be. Mmh, the cookies look so tempting. I would love to try them with a cup of coffee. A real treat, thank you Vickie! Chocolate and toffee? These sound addictive and delicious! Thank you, Vicki! These sound terrific! I used to love butter brickle ice cream when I was a kid, and that might the last time I’ve had brickle. But you’ve got me hungry for it now! Good stuff – thanks. 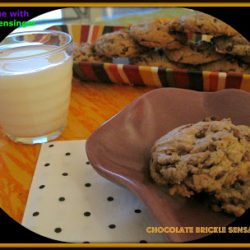 Incredible looking cookies…they sound amazing! Chocolate and toffee…a sensational combo!